Your garage doors definitely do not need to be boring or utilitarian. Instead of limiting yourself to the standard offerings of your average garage door manufacturer, come to Dynamic Garage Door for custom garage doors in San Diego CA. 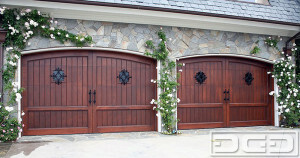 When it comes to custom garage doors in San Diego CA, carriage style doors are perhaps one of the most popular options. They are especially nice on detached garages to complete the original carriage house look, but they can also be updated to look totally at home on attached single or double car garages. At Dynamic Garage Door, we know how to design carriage style doors so that they work with roll-up garage door openers, but look exactly like vintage swing-open doors. In contemporary and mid-century modern homes, the design is often deceptively simple. Without a lot of architectural detail, the quality of your finishes really stands out, and you would never get away with low-end garage doors. Instead, you need quality custom garage doors in San Diego CA that incorporate visually rich materials like mahogany, copper, glass, etc. At Dynamic Garage Door, we can help you design a door that is perfect for your architecture and your personal style. At Dynamic Garage Door, we take pride in maintaining good relationships with our customers long after their new custom garage doors in San Diego CA have been delivered and installed. We also provide garage door maintenance and garage door repair services designed to preserve the beauty and functionality of your doors. It is wise to trust us with these activities rather than your average contractor, because we understand the specific maintenance needs of your custom doors. Want to start brainstorming custom garage door design ideas with our experts? Dial 855-343-3667 now.